monkeyink:blog: Renegade Craft Fair LA this weekend! Loading the car for Renegade Craft Fair LA! We'll have our Tent-o-Art. Come see us if you can! 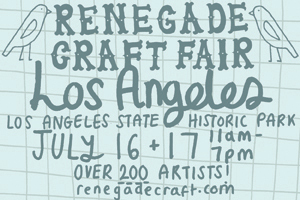 The Renegade Craft Fair returns to Los Angeles State Historic Park on July 16 + 17, 2011, from 11am - 7pm for our 3rd Annual Los Angeles Fair!! Check out LA's greatest outdoor marketplace for handmade goods, featuring over 200 artists! The Renegade Craft Fair is always free-to-attend! Attendees can get involved with our hands-on crafting activities, check out our bar for some cold libations, and purchase food from terrific LA food trucks!